Your product registration has been submitted successfully. Thank you. Do You Have a Question? We’re Here to Help! Whether you have a question about a product, need technical support, or just wish to provide us with feedback, we are here to listen! Give us a call, send us an email, or connect with us on social media. Please send us Questions via email. A Pride Mobility representative will contact you very soon. 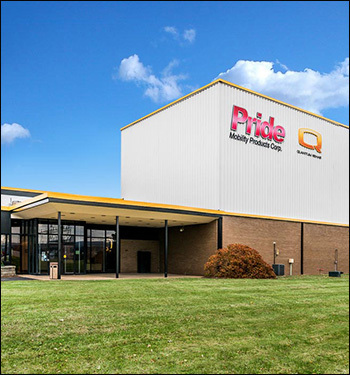 Follow us to see updates, industry news, new product launches and glimpse into Pride Mobility Products Company. How to become a Pride Provider? Pride Mobility Products Italia S.r.l. Pride Mobility Products New Zealand Ltd. Pride Mobility Products (Shanghai) Co., Ltd.